Boys National School, Brookstone Road. 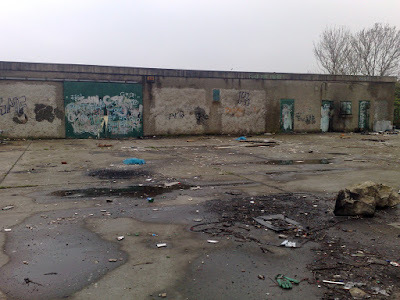 over the past 10 months the abandoned council depot at Seagrange Park has become more derelict, has experience increasing fly tipping and has now been raided by Gardaí with dogs looking for drugs. The perimeter wall has been broken and security compromised. What is surprising is that this is a Fingal County Council facility that has been left unattended and unlocked for the majority of the time. We are seeing serious planned dereliction by the council, creating a security risk and a health hazard and an eye sore. Use of depot compound was promised to local GAA club Dubh Ghall as far back as last summer but provision of the site to the club has not materialised. The depot is on land which I am told is leased by the council and sits on an area of land that is zoned open space / recreational adjoining the Brickfield land and Seagrange Park that is prone to flooding and forms part of the flood plain. Previous plans by the council and developers to rezone the land for development of high rise have be set back by the action of the community, local residents associations and the assistance of the Socialist Party Councillors and local rep. Brian Greene. Their running down of this facility and the failure to date to see it put to better community use (which would help secure it) asks serious question for the councils intent for this area. The Socialist Party is continuing to working with local sports associations and residents to put maximum pressure on Council and local Councillors to see that this depot is properly maintained cleaned & secured and put to better community use in keeping with its zoning.